WITH MANY HIGH-PROFILE clubs dealing with a new manager, it means that some big names have struggled for game-time. And with wounded pride comes an opportunity for other sides to jump in and persuade them to make a move. So, with the transfer window ticking towards closure, here are some players that could be minded to head elsewhere. It’s an obvious one. 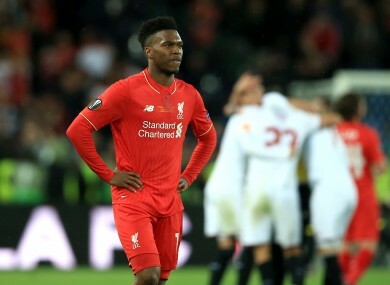 Sturridge wants to play centrally and has been quite public with his thoughts on the subject. It’s hard to really know how Jurgen Klopp feels. Going by his dealings with Mamadou Sakho after the Frenchman got on his wrong side, Sturridge’s response to a managerial decision may have rubbed Klopp up the wrong way. The boss likes hard work, grit and determination. Perhaps he may perceive Sturridge’s complaints as being weak and an offer could tempt him to push the striker out the door, albeit temporarily. This also depends on Sturridge’s own situation. Three years at Liverpool and a rake of goals. But there still seems to be doubts about him. Is the time right to look at alternatives? To prove a point? Maybe his team were looking to gather their thoughts at the end of the season but if a bid comes in today, they may just look at it as an opportunity. What clubs could be interested? Tottenham, West Ham. Three games into a new Premier League season and the Spanish midfielder has played 12 minutes in total. Of course, that cameo resulted in him setting up Diego Costa for a game-winner against Watford so if Antonio Conte was having some reservations, they’ve probably been put on pause. For the moment. Fabregas is bound to be monitoring the club’s transfer activity closely in the coming hours. One target is box-to-box midfielder Marcelo Brozovic from Inter and that just squeezes things that bit tighter for the former Arsenal man. The 29-year-old enjoyed a superb debut season with Chelsea, developing an excellent partnership with Diego Costa and finishing the campaign as a Premier League champion. But, his major drop-off was well-documented last term and he’s not an automatic starter anymore. Again, pride comes into this. With no European football, Fabregas is likely to remain on the periphery for the season, if he stays. Conte has no reason to rotate, unless there are injuries. A late, cheeky bid could raise an eyebrow. What clubs could be interested? Juventus, Inter Milan. In his first season at Manchester United, Morgan Schneiderlin featured very prominently. But, things have dropped off since Jose Mourinho’s arrival. He’s managed seven minutes of game-time between the Community Shield and United’s first three Premier League fixtures. Perhaps Mourinho sees him as a trusty replacement to whoever his first-choice midfield two is. But it appears the United boss is a fan of Ander Herrera in a deeper role, while Marouane Fellaini is quickly proving he wasn’t just a teacher’s pet under Louis van Gaal but, actually, a pretty decent footballer. Still, Schneiderlin is a slightly different proposition and he’s certainly a more physical and aggressive personality than Herrera and particular fixtures, like the impending Manchester derby, may suit the French international. But, the diminishing status is sure to affect him. It’s early in his United career and it seems unlikely he’ll move right away. But it’s worth keeping an eye on. What clubs could be interested? Arsenal, Monaco. How is the French international – such a superb performer at Euro 2016 – still at Newcastle? With this story having gone on so long without a resolution, it leaves the club and player in unenviable positions. Sissoko wants to leave and had his heart set on a high-profile move to Real Madrid immediately after the tournament in France. That was never even on the cards but some Premier League sides have expressed an interest. But all have turned their noses up at Newcastle’s £35m evaluation. Sissoko is probably on the shortlist of a few clubs but he’s hardly first choice. So, whether or not he moves somewhere today is probably dependent on if the likes of Tottenham or Juventus are successful with other targets. If not, they may try and get Newcastle to lower the asking price and pull the trigger on the deal but it’s a big day for Benitez and his board. The manager may feel that Sissoko’s mind has been turned already and that selecting him in games is worthless. He hasn’t featured in any of the Magpies’ five Championship fixtures so far and perhaps that’s the way Newcastle would prefer it. What clubs could be interested? Tottenham, Juventus. The Ivory Coast international has been an expensive failure for Manchester City, scoring just six league goals since joining from Swansea last January. He swapped consistency for playing second-fiddle and it never worked for him. It will only get worse under Pep Guardiola and expect him to secure a move elsewhere at some stage today. What clubs could be interested? Everton, Napoli, West Ham. Email “5 high-profile players who should be the subjects of last-gasp deadline day bids”. Feedback on “5 high-profile players who should be the subjects of last-gasp deadline day bids”.